While on a diplomatic trip to Japan, primarily aimed at strengthening the two countries' economic cooperation, Angela Merkel didn't spare her host Shinzo Abe a thinly-veiled critique of his revisionist tendencies. 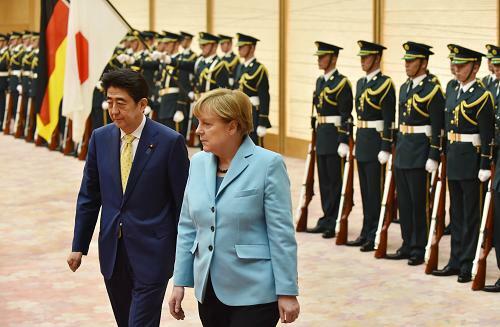 A skillful diplomat in her own right, the German Chancellor avoided full frontal criticism and decided instead to bring her own country's example to indirectly comment upon Abe's fervent militarism, not to mention his dubious reluctance to admit Japan's war crimes. Merkel stressed the necessity to face historical responsibilities (though she did not say anything about paying for their damages…) in order to regain the respect of the international community. She continued by quoting the words of the former German president Richard von Weizsaecker who, in 1985, referred to the day Germany was defeated as "the day of liberation" and denounced the moral blindness of those trying to deny the country's Nazi past. It doesn't take a particularly gifted statesman to read Merkel's remarks as clear allusions to the increasingly revisionist positions that the Japanese government has been pushing since Abe took office. And in fact the parallel between German Nazism and Japanese Imperialism did not go down well with the ruling government. Fumio Kishida, the minister for foreign affairs, declared during a press conference that the parallel was an inappropriate one, adding that the two countries have gone through World War II differently and have to deal with different neighboring countries. As noted on twitter by the Tokyo-based journalist David McNeill, the Yomiuri Shimbun, a newspaper close to the Japanese government, omitted Merkel's comments in regard to her country's Nazi past. Not everyone in Tokyo agrees with Abe's intransigent stances, though. Chinese official news agency Xinhua has in fact published an interview with Yutaka Yoshida, a Japanese historian very critical of his country's attitude towards its imperialist past. This "uneasy" diplomatic exchange is all the more relevant as Japan readies for the "celebration" of the 70th anniversary of the end of the Second World War. Political commentators in the region are extremely concerned about what Abe will say on the said occasion. In 2013 in fact, the Japanese Prime Minister sent a commemorative pine tree to the Yasukuni Shrine, a Shintoist sanctuary in Tokyo where the remains of those who fought for Japan in the war rest, including those of war criminals whose atrocious deeds are anything but forgotten by Chinese and South Koreans. While coating his rhetoric in ambiguous phrasing such as "Japan is back," his electioneering mantra or talks about "overcoming" the national past, it is quite clear that Abe's stance on his country's war crimes is everything but clear. Even the Obama administration has not hesitated in criticizing Japan's revisionist positions. Wendy Sherman, under secretary of state for political affairs, has recently lamented Abe's recalcitrant views on Japan's (former) enemies, noting how such stances hinder the pacification of old grudges. With the Trans-Pacific-Partnership (TPP) still on the negotiating table, the United States is eager to solve regional problems so that its economic interests in the area can be secured. Shinzo Abe is in fact due in Washington as early as May, right after the 70th anniversary of the end of WWII. Jennifer Lind, author of "Sorry States: Apologies in International Politics" and faculty associate at the Reischauer Institute for Japanese Studies at Harvard University, was quoted as saying that "the reconciliation of two countries after the war requires the recognition of war crimes." Nonetheless excuses and public amends are often unconvincing and rarely go beyond words. Reparation payments are in fact rarely handed out by those countries that have invaded others, and that is probably why Angela Merkel will never mention such a thing in public. If in fact the way Germany has dealt with his historical responsibilities is undoubtedly exemplary, especially when compared to the way its former allies, Italy and Japan have, the way it is now behaving within Europe is far from stainless. Along with the European Central Bank and the International Monetary Fund, Germany is in fact responsible for inflicting inhuman austerity measures on weaker southern economies such as the Italy, Spain, Portugal and, most crucially, Greece. Greece has courageously reiterated the fact that Germany should be making reparations payments for the crimes and looting that took place in Greece during World War II. This is to say that words should always be followed by facts when it comes to facing the criminal past of an imperialist country, be it Japan, Germany or any other aggressor. During her Japan visit, Angela Merkel didn't spare her host Shinzo Abe a thinly-veiled critique of his revisionist tendencies.